shine brite zamorano: Pablo. Lobato, that is. I caught on to the work of this illustrator while looking for current abstract illustrators. The beginning drawing class I teach at Miracosta was doing a project based on abstract style and color schemes, so I wanted to find someone who was influenced by Picasso and the like, but was, you know... still alive. Enter the other Pablo. Lobato that is. The college class did a good job with it. They copied an image of his 3 times, but using a different color scheme each time. I felt this allowed them to get into a way an artist could abstract a person into an image that was primarily made up of geometric shapes. By copying, it also allowed them to focus more on working with the different color groups, since the shapes and values were already laid out for them in Pablo's originals. I thought it would be interesting to see how my 4th graders rolled with the same types of concepts. Taking a natural thing and using geometric type shapes to abstract it, while still making it look 3d by using tints and hades of a color. THey only created a monochromatic drawing. We had already worked with chalk pastels, so I thought it would be good to practice with them again. We used a grey paper so we could draw with white chalk. I have found corrections are easier to make this way. 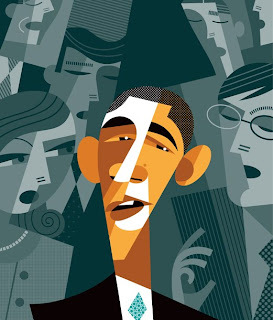 We used Pablo's Barack Obama illustration as our subject. The kids enjoyed the process. There was less discomfort with the drawing portion. Any time they are asked to draw realistically from observation, there is resistance from those who "can't" do it. Since the image is already abstract, I emphasize that it already looks "weird" and if their interpretation looks different or off in any way, it just makes it more abstract.